OKRs champion transparency. But sometimes you need private OKRs. Gtmhub supports both. You can also set and manage OKR views permissions. Working with confidential or sensitive information within Gtmhub could be handled in two different ways. The first approach is setting custom permissions to a dedicated OKR session. This allows you to select who (within your organization) can access a given session and/or contribute to it. But sometimes the sensitive information lives in a session where everyone within your organization has access to. In this case, there's another approach that Gtmhub supports: Private OKRs functionality. What is a private OKR? Many times, individuals wish to set private OKRs. Sometimes, these objectives are set privately between a person and their supervisor. For various reasons, it may be impractical to have such private objectives visible to everyone. For example, these could be personal development objectives such as “Get along better with colleagues” or “Improve writing skills”. Private OKRs allow you to create and align OKRs with restricted rights. A private OKR is visible for the objective owner and their managers. 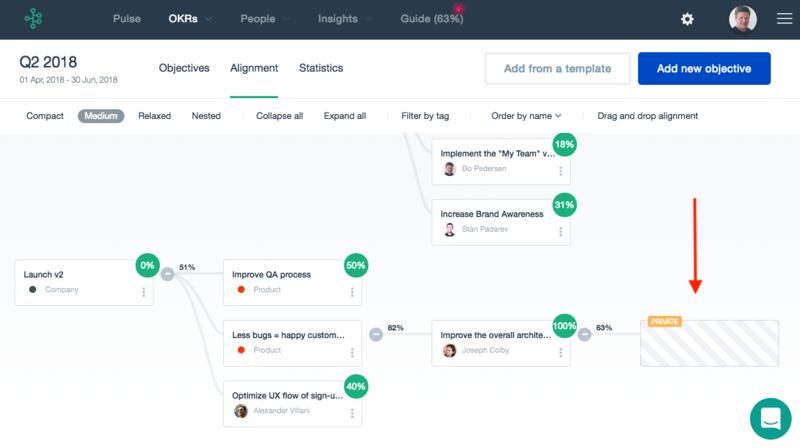 Note: Avoid assigning Key Results to other teammates for a private OKR, as they won't be able to see the objective as long as it's marked as private. How to create a private OKR? 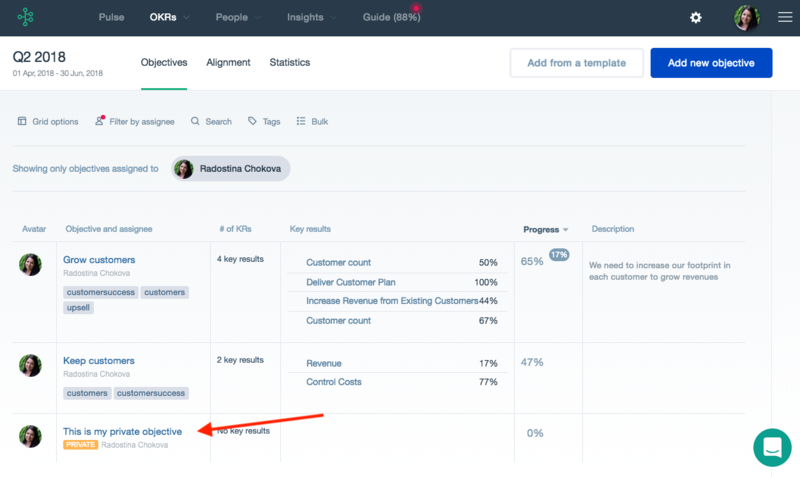 From OKRs > Objectives or Alignment click on the Add new objective button. This option can be changed if needed via Edit objective (option from the three dots menu) and ticking/unticking Make this objective private, as shown below. Private OKR details are visible to both the objective owner and their managers. 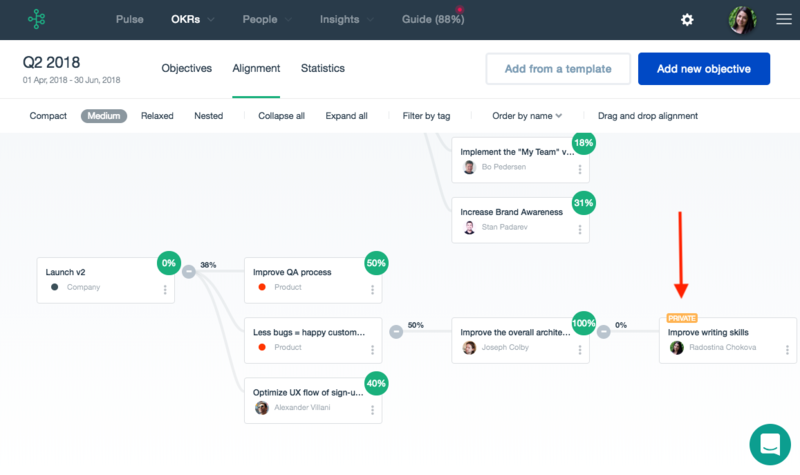 It's easy to spot in the objectives list view (OKRs > Objectives) and in the Alignment view (OKRs > Alignment). For the rest of the organization, the private OKR appears with restricted access - users would see where it fits in the session tree or the nested view but won't be able to get information on the objective attributes such as objective name, key results, owner. 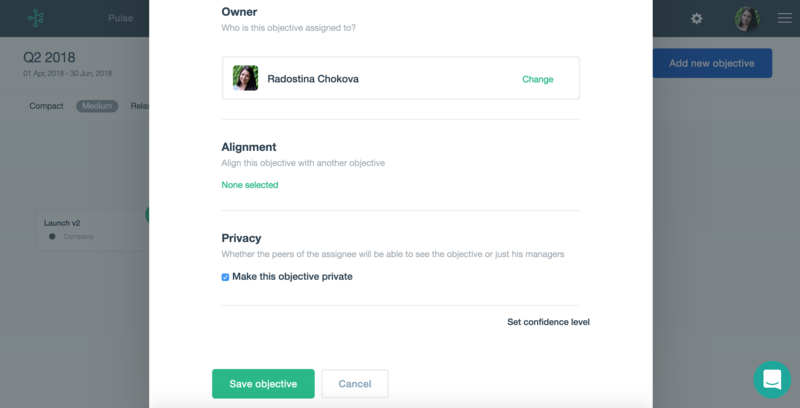 The private OKR won't appear in the objectives list view but only in the Alignment view. All private OKRs contribute toward session progress. If tagged they'll be highlighted in the Alignment view and progress on private OKRs will be calculated in Pulse and Statistics but they will still remain with restricted access.